Copyright © 2002 Thames Valley Minerals - This image is copyrighted. Unauthorized reproduction prohibited. 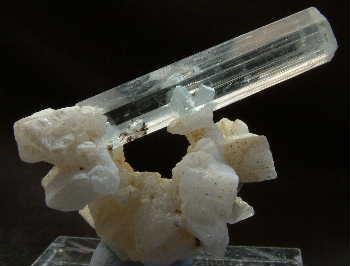 A double terminated aquamarine sits on a horshoe shaped cluster of orthoclase. There is some orthoclase included in the crystal and some minor schorl. Very aesthetic little piece.